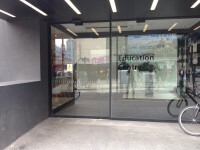 The Education Centre is located on York Road. 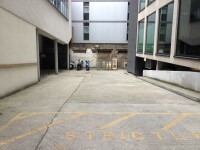 The centre has very limited parking at the rear of the building. There is also public parking on Leake Street opposite the main entrance. The nearest bus stop is County Hall (Stop G), it is located on York Road and is approximately 30m from the centre. The services that stops at County Hall (Stop G) are the 76, 77, 211, 341, 381, 507 and N381. 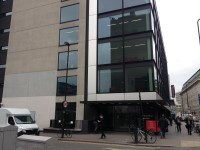 The nearest train station is Waterloo which is approximately 180m away. 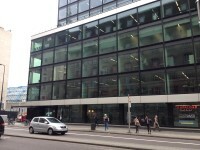 The nearest underground station is Waterloo which is approximately 180m away. The following link is for information regarding Bus travel. The following link is for information regarding Train travel. The following link is for information regarding Tube travel. 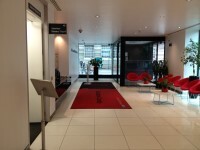 The Patient Advice and Liaison Service (PALS) is located on the ground floor of the St Thomas' Hospital. The car park is located at the rear of the centre. The car park type is sheltered. There is/are 1 designated Blue Badge parking bay(s) within the hospital car park. 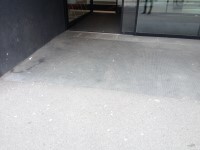 The dimensions of the designated Blue Badge parking bay(s) surveyed are 242cm x 475cm (7ft 11in x 15ft 7in). 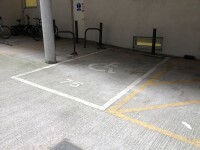 The nearest designated Blue Badge parking bay is approximately 40m (43yd 2ft) from the centre entrance. Parking at the health centres in Lambeth and Southwark is very limited, and patients are advised to use public transport where possible. To find out more about parking at the different centres, please see the list of community locations. This information is for the entrance located on Leake Street. The width of the door opening is 166cm. The width of the door opening is 165cm. 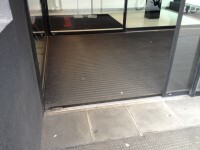 The ramp/slope is located in front of the entrance and between the two sets of doors. 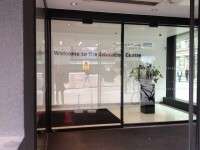 The Education Centre reception is located to the left on entering the centre. 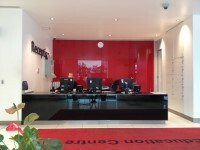 The reception area/desk is approximately 5m (5yd 1ft) from the main entrance. There is not level access once inside. You are on Level Change (Seminar Rooms 1-4). Skip to the next section. 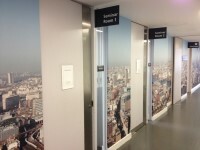 The ramp/slope is located in the corridor to the right after reception leading to the seminar rooms. The lighting levels at the ramp/slope are medium. 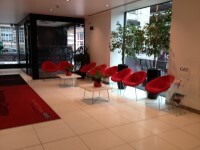 The waiting room / area is approximately 3m from the main entrance. 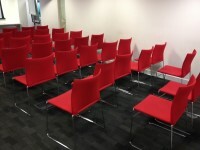 You are on Room / Area (Seminar Room). Skip to the next section. The name / number of the room / area surveyed was; Seminar Room. There is not level access to the room / area. There is a flashing fire alarm beacon within the room / area. 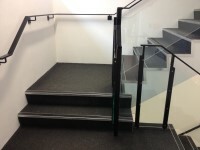 The floors which are accessible by stairs are G, 1, 2, 3, 4. The stairs are located to the left on entering the centre and then ahead. 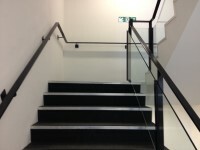 The stairs are approximately 16m from the main entrance. 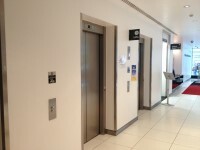 The lift is located to the left on entering the centre and then right of the foyer. The lift is approximately 12m (13yd 4in) from the main entrance. 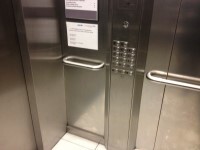 The floors which are accessible by this lift are G, 1, 2, 3, 4. The clear door width is 100cm (3ft 3in). The dimensions of the lift are 140cm x 193cm (4ft 7in x 6ft 4in). 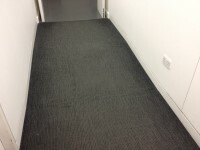 This accessible toilet is located in the corridor to the right past reception. 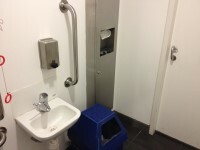 This accessible toilet is approximately 16m (17yd 1ft) from the main entrance. The dimensions of the accessible toilet are 150cm x 220cm (4ft 11in x 7ft 3in). The height of the towel dispenser is 118cm (3ft 10in). The height of the soap dispenser is 103cm. The shared toilets that were surveyed are located to the left on entering the centre. The shared toilet(s) is/are approximately 12m (13yd 4in) from the main entrance.